Dutch painters in the early 1800s sure knew how to combine lines and colors. 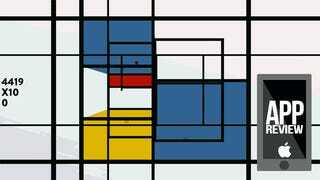 They called the movement "De Stijl", which is Dutch for "easily replicated in Photoshop" (or possibly "The Style"), and artist Piet Mondrian was one of its prime movers. His Composition series defined the style, inspiring artists of all types to this very day—even game developers. Michael Silverman's Composition J is a love letter to both Piet Mondrian's work and classic Windows Entertainment Pack PC game JezzBall. In JezzBall the player is tasked with diving a room into smaller segments while ball-shaped molecules bounce about—sort of like the arcade game Qix. Composition J takes that concept and runs with it, adding a side-scrolling playfield with the ability to rotate it in three dimensions, along with Mondrian's beloved primary colors. As the trailer says, it's all about drawing walls to capture balls. Touch the screen and hold to place a line. Tap with another finger to change the line's orientation. Drag with two fingers to rotate. As long as no ball crosses the path of your line, bam—you're a ballsy Neo-Plasticist. There's a slight problem of perception here, as is often the case with abstract art. I'm still finding myself struggling to determine which lines placed where will trap which balls. The game's presentation is as clean and simple as its inspiration, so there isn't much in the way of help. When my lines do connect I'm treated to a work of interactive art that would shock and delight Piet Mondrian, especially considering he's been dead for nearly 70 years. And hey, if you're curious about the game but not enough to commit a dollar, you can always play the Unity-powered web version.